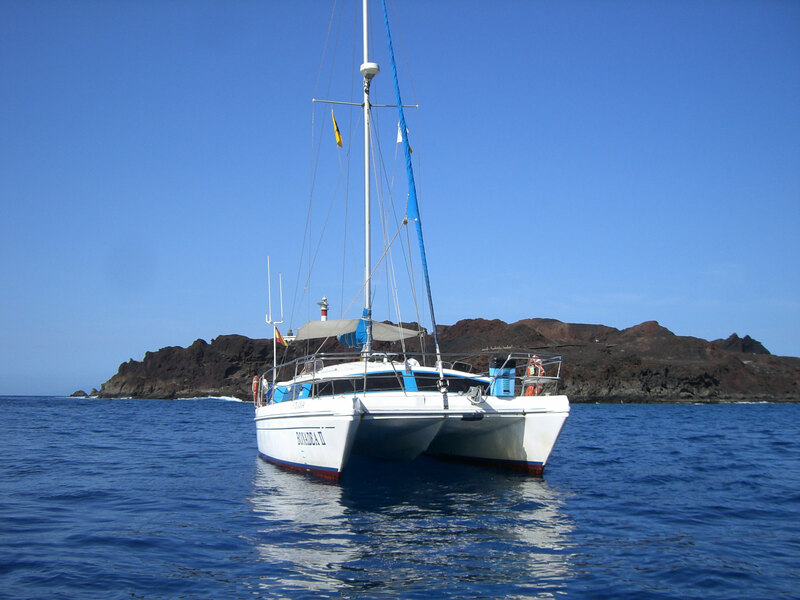 Welcome to the Bonadea II catamaran, enjoy a whale and dolphins ecological watching tour in their natural environment in South Tenerife, Puerto Colón – Las Américas. 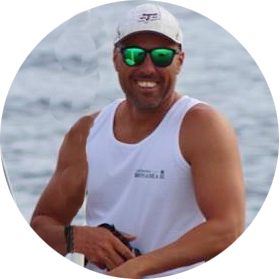 The company has been working more than 26 years in charter sailing and whale watching. 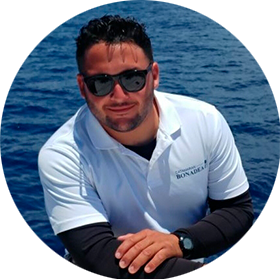 Bonadea II´s objective is to show our clients the natural environment where dolphins and whales live and satisfy them with a fantastic cruise on the south-coast of Tenerife. We have license to take 22 passengers. 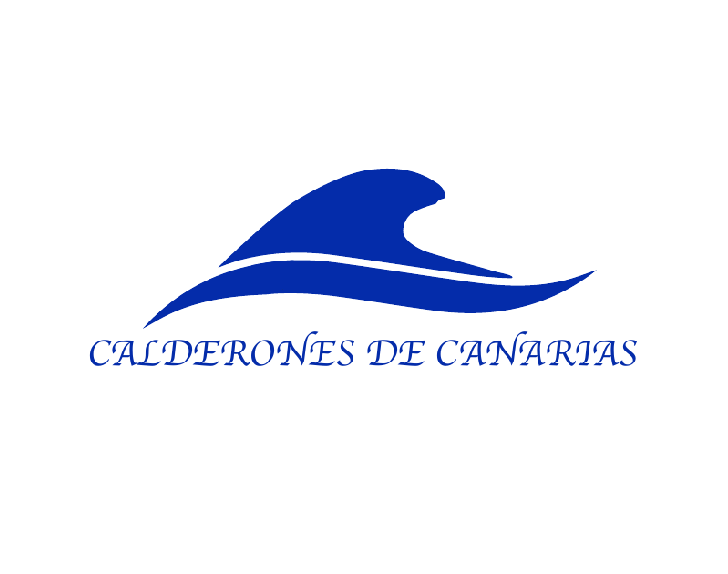 It has the Blue Flag title for whale watching, authorised by the Tourism Ministry of the Canarian Government and the Ministry of Environment of Spain. We develop our activity in the Zone of Special Conservation (ZEC) Tecno-Rasca marine strip integrated into the Natura 2000 Network. 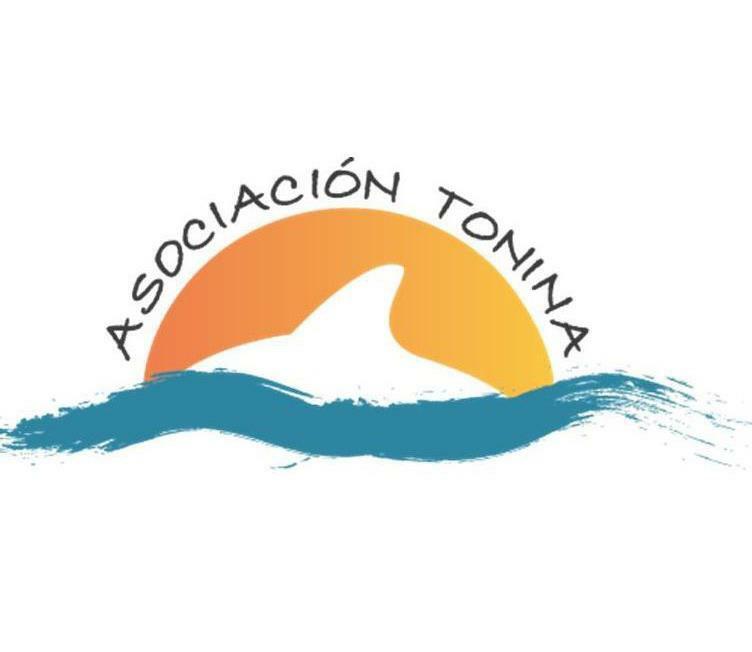 We collaborate with the Wildlife Recovery Center la Taonilla del Cabildo de Tenerife, the University of La Laguna and Associations such as Tonina and Calderones de Canarias. At the scheduled time, departing from tier nº 4 of Puerto Colón, we will set out in search of the whale and dolphins. The area in which we will sail will be between the lighthouse of Rasca and Blue sea and until a distance of 3 miles off the coast where depths can reach one thousand meters. 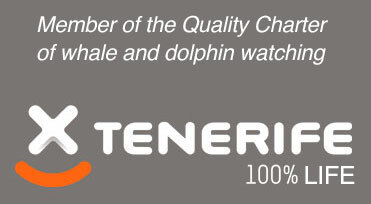 We will be in search of the pilot whale, one of the main species resident in the south of Tenerife. Close to the coast we can find dolphins, turtles and seabirds, with some look we can also see some of the migrator whale and dolphins that frequent our islands. We will approach to a safe distance so as not to disturb them and to be able to observe them, photograph and record them. 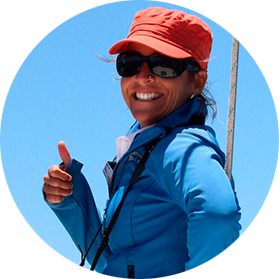 The crew will be happy to explain and show you the information about whale and dolphins. 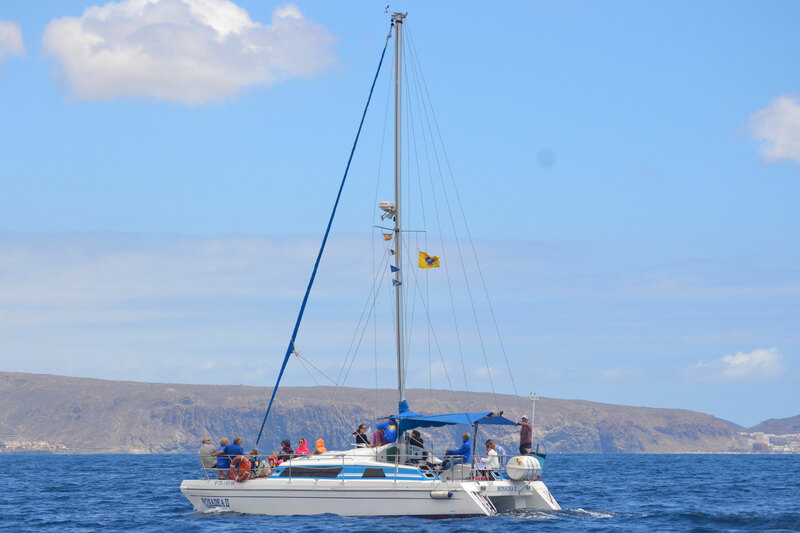 We have on board, refreshments that will be served and we will then return to the port contemplating the wonderful views that the island offers us from the sea: beaches, Palmar, Los Cristianos, Costa Adeje, El Teide, etc. After the sighting of whale and dolphins we go to a bay where we will anchor to snorkel and swim, then enjoy some snacks and drinks. This excursion has the same characteristics as the previous one, but with the difference that after seeing the whales and dolphins we will continue our adventure towards a natural bay of crystal waters, where we will anchor. The time has come to take a swim, snorkel and take refreshment that will be served they will be offer by our crew along with a snack and fruit. We will return sailing very close to the coast to admire the beautiful views of the beaches of Costa-Adeje. The boat is a PROUT model ESCALE 39 it has all the safety measures required by the Spanish and European laws for navigation with passengers. All yearly periodic reviews satisfactorily, approves. BONADEA II is equipped with all the security and emergency systems required by sea captaincy. This includes life jackets, life rafts, fire extinguishing systems, radio beacon, VHF with distress, etc. 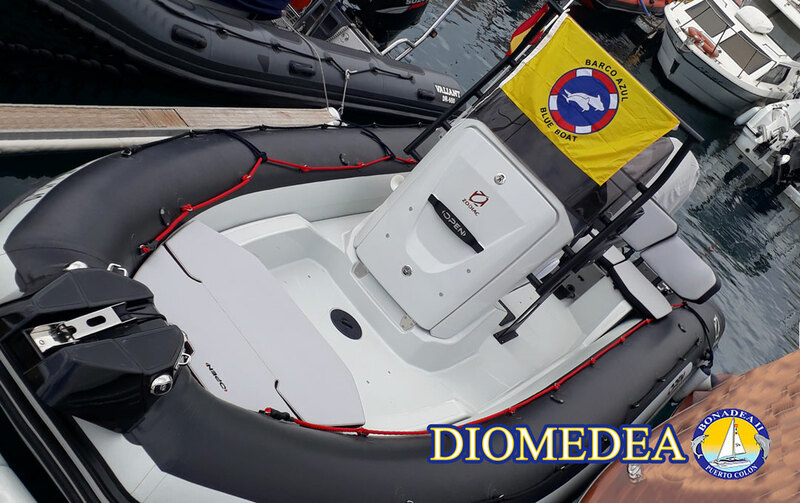 DIOMEDEA, is our new boat for whale watching and bird watching trips. We also collaborate with the marine environment. 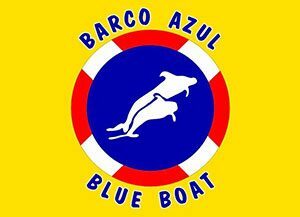 So, if you want a private tour for your family or people who love wild life and the marine environment, this is you boat! With our Private Ecological Tour, you can choose how long you want to enjoy the trip. Perfect for groups of nature photographers, researchers and diverse projects. DIOMEDEA, is 7m long, 2,50m wide, it can seat 6 people and has a small sundeck in the bow. Enjoy listening to the Whales and Dolphins with our Hydrophone. You can book or buy your ticket in our own office, in Puerto Colón-Playa de Las Américas. We are responsible with the environment, we conserve, care and protect the marine environment, collecting the ocean waste and helping marine animals with problems. We also collaborate with the recovery and release of turtles and tracking and identification of pilot whales. We do not organize or market combined trips. We have the complaint sheets at your disposal from 10:00 to 18:00.